"Design is the rendering of intent." What if education leaders approached their work with the perspective of a designer? This new perspective of seeing the world differently is desperately needed in schools and begins with school leadership. Alyssa Gallagher and Kami Thordarson, widely recognized experts on Design Thinking, educational leadership, and innovative strategies, call this new perspective design-inspired leadership—one of the most powerful ways to ignite positive change and address education challenges using the same design and innovation principles that have been so successful in private industry. Design Thinking for School Leaders explores the changing landscape of leadership and offers practical ways to reframe the role of school leader using Design Thinking, one step at a time. Leaders can shift from "accidental designers" to "design-inspired leaders," acting with greater intention and achieving greater impact. You'll learn how viewing the world through a more empathetic lens—a critical first step on the path to becoming a design-inspired leader—can raise your awareness of the uniqueness of your teachers and students and prompt you to question the ways in which they experience your school. Opportunity Seeker. Shifts from problem solving to problem finding. Experience Architect. Designs and curates learning experiences. Rule Breaker. Challenges the way things are "always" done. Producer. Gets things done and creates rapid learning cycles for teams. Storyteller. Captures the hearts and minds of a community. Full of examples of Design Thinking in action in schools across the country, Design Thinking for School Leaders can help you guide your school to the forefront of the new design + education movement, one that will move traditional education into the modern world and drive the future of learning. "Design thinking is more than a fad; it is a set of principles around which creative people find and solve problems and unlock opportunities. For the first time, two veteran educators and expert design thinkers provide both theory and clear, highly practical guidelines for how school leaders can shift from being mere managers to becoming design-inspired leaders. A must-read for all school leaders seeking to build and sustain nimble, adaptive organizations that will positively impact our students in an increasingly VUCA (volatile & complex) world." "What if school leaders were able to approach their work more like designers? That is the beautiful question at the core of Design Thinking for School Leaders. 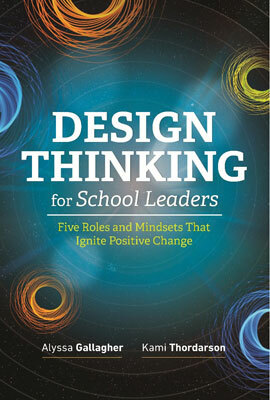 The authors Alyssa Gallagher and Kami Thordarson show how to adopt five design-inspired mindsets that can transform the way you lead—and the schools you are leading." "A beautiful balance of philosophy and practicality, conversation and critique, Kami and Alyssa provide a much-needed guide for human-centered leadership. Where some books on school leadership get caught up in a quagmire of quantitative data analysis, and others read more like sermons for salvation, Design Thinking for School Leaders provides a relatable and conversational guide, informed by best practices of empathy fueled innovation." Alyssa Gallagher is an experienced public school educator, school and district administrator, facilitator, and educational consultant. She has successfully led districtwide blended learning initiatives, helped schools create integrated STEM programs, and launched strategic plans using Design Thinking. Kami Thordarson has worked in many roles as a public educator—from classroom teacher to professional development and curriculum designer. Thordarson is involved with the design thinking movement in K12 education and, in her current role as an administrator, works to lead a district in integrating technology into learning and innovating practices that fully move students into more personalized experiences.